Vintage Valentines as tokens of True Love or obligatory classroom exchanges, vary from sincere and romantic, to silly and frivolous, to the odd and inexplicable. Scroll down and use the category links on the right side to browse our collection and feel the LUV! Don't give me the ICY EYE - Love - Lots of Love - My Valentine! 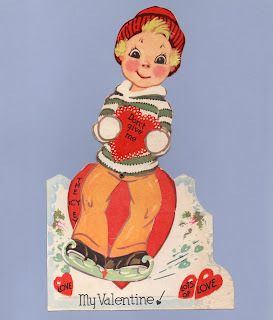 For My Valentine ~ In Cupid's Thrall! Mercy Me! Am I in love? Do tell me what's the matter. Every time I look at you My heart goes pitter-patter. I do so appreciate your blog! You have been so helpful in enabling me to identify my collection of valentines. I haven't been good at commenting ... thought it was about time! Thanks Sandi! We'll have more informative pages regarding some of the artists and companies coming soon. I'm so glad you've found our pages helpful. 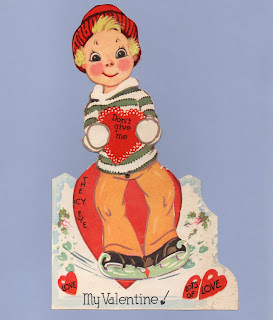 Welcome to the Vintage Valentine Museum! Come peruse our collection of VINTAGE VALENTINES, arranged by category for easy searching. The information and images on our pages are regularly updated so please recheck listings that are of special interest for any new card images and/or new details that may appear. If you have additional info about any of our cards, we really appreciate a comment added to that entry. So, please - let us know. We've created this space to share some of our favorites with you and to spread the LUV! WE BUY VALENTINE COLLECTIONS! Look for the link below for more information. We've found many of our images and blocks of out text on Facebook, other social networking sites, and blogs. 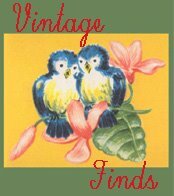 We do appreciate the interest and don't mind but PLEASE give credit to the VintageValentineMueum.com for any of our images or quotes you post. A link is a FAB way to do that and very much appreciated. No commercial use of our photos or text is permitted. Be advised that many of these valentines are not actually old enough to be considered "in the public domain" yet and my photos of these cards are certainly not "in the public domain." Please, I appeal to your sense of fair play, be respectful of the time, effort and money spent that the writing and collection of images here represent. If you wish to re-blog our text or images or otherwise re-publish them on the web or in print, please do NOT use them IF you are unwilling to credit this site for them. It only takes a second to give proper credit for what I have freely shared with you. Animals - Insects, Bugs, Worms....Ewww!